James Keith of College Hill and Linda Fusco of Aycock receive the Greensboro Beautiful Ecology Award. 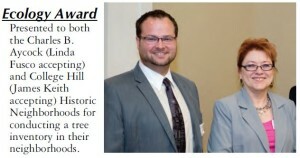 The College Hill Tree Inventory has been honored with an award from Greensboro Beautiful. The volunteer organization presented its annual Ecology Award to the College Hill Historic District and the Aycock Historic District for the two tree inventories funded by the neighborhoods’ Municipal Service District funds. Click here to see the College Hill Tree Inventory. Click here to see the Greensboro Beautiful fall newsletter. Special thanks to Joe Wheby for nominating College Hill for the award.